I never actually set out to be one of those crunchy, natural mothers who breastfeed their children past the date they start school. I had a simple goal of breastfeeding until my babies got their teeth. Yet somehow, I've ended up being one of those mamas who nurse pretty much until those first teeth fall out! How did that happen? 1. Because I'm lazy and there just never seemed to be a right time to stop nursing and wean. If it ain't broke, why fix it? Time has passed and I have never had the time or energy to withhold the comfort or nutritional benefits that breastfeeding brings. Natural weaning will happen anyway (average worldwide age is between 4 and 7 and most children will lose the ability to latch when they lose their milk teeth), so what's the rush? 2. The extra immunity means fewer illnesses. And, when they do become poorly, it's probably not as bad as it could have been. Breastfeeding doesn't guarantee a healthy child, but I'm pretty sure it helps avoid the worst of the usual bugs that toddlers seem to attract, particularly when they start childcare and school. Plus, breastmilk is incredibly easy to digest, so when nothing else will stay down or they won't eat, you know they won't starve and there's less chance they'll get dehydrated if they are really sick. 3. I'm scared of losing a valuable tool in my parenting armoury. How else do you get a crotchety, overtired toddler to give in and nap? How else do you calm a tantrum? What better way is there to heal a small child's broken heart after their favourite toy has been thrown in the washing machine/run over by a car/broken by their older brother or sister? And, as my child has grown older, it's sometimes been the only bribe that will work! 4. I don't want to lose my cleavage. OK, so this is a pretty vain reason. But before I had children I wasn't particularly blessed in the chest department. So I was very pleased when I first got pregnant and I developed a buxom bosom. And while I'm breastfeeding, my womanly figure remains. There is, of course, a chance, it will remain when we wean, but it may also deflate. I'd rather wait and see what comes naturally. 5. I like the cuddles. I love the closeness we enjoy in our special times together. I actually think it's quite good for me to take time out and to put my feet up and rest while we enjoy some quality time. And I adore just staring down at a content face knowing I am providing liquid love. 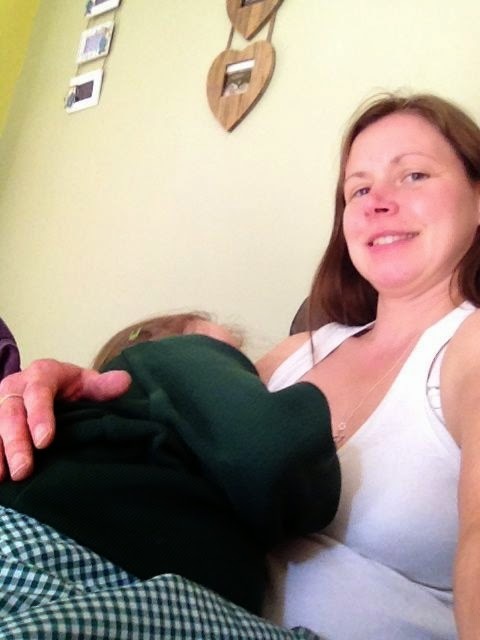 Are you breastfeeding beyond babyhood? What reasons would you add? As you know, I'm not. I was intrigued by your reason #3: I don't think that I lost a weapon in my parenting armoury when I stopped breast feeding, I just adapted and learned a whole load of new ways to work. I love cuddles too, always gorgeous, and Isobel really loves a good snuggle at the moment. Also your reason #4 made me laugh - my cleavage definitely reduced when I stopped feeding - no harm there though, cos Hubby still likes it!